Every year, the National Academy of Medicine awards the Adam Yarmolinky Medal for exceptional service to a member whose discipline falls outside the traditional health sciences. According to the NAM’s Articles of Organization, at least one-quarter of members must represent professions outside the health and medical fields, including the natural, social, computational, and behavioral sciences; as well as law, administration, and engineering. 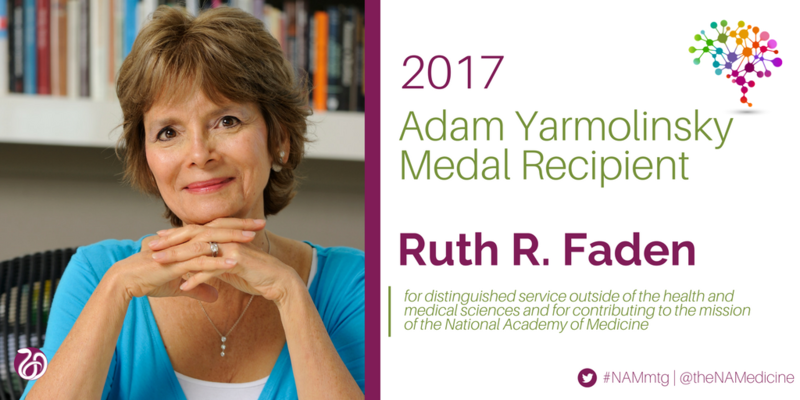 The 2017 Yarmolinsky Medal was awarded to Ruth R. Faden, founder of the Johns Hopkins Berman Institute of Bioethics, for her record of distinguished service to the National Academies. In the following interview, Ms. Faden describes her first encounter in bioethics, explains why the public’s understand of bioethics is important, and shares advice to her younger self. Bioethics is a field of inquiry that looks at ethical issues in the clinical practice of medicine, nursing, and other health professions, ethical issues in public health and health policy, and ethical issues in biological sciences and research. In a nutshell, our field addresses the ethical challenges that come up in clinical practice, national and global health policy and the biomedical sciences. How did you get interested in bioethics? When I was young, there wasn’t a field of bioethics like there is today. I fell into bioethics because of interests I had regarding women’s health and women’s health rights. I was a graduate student at the University of Chicago in a master’s program in the humanities. However, I got a job in the OBGYN department at the medical school to recruit women to participate in a clinical trial of a new IUD. I actually asked the lead investigator if I could participate in the study and his response to me was, “You should wait until we learn more.” I was shocked. It was a true “aha” moment. I was spending a lot of time encouraging women to participate in this trial, but I had just been told not to enroll in it myself. Until this point, I had never thought about the ethics of research with human subjects. I had never thought analytically about ethics and science, at all. This early experience never left me. I went on to do a social science dissertation on informed consent. Someone on my committee worked in bioethics and, the next thing I knew, I had discovered that there was an entire field of people interested in the same questions I was. I ended up pivoting early in my career to make bioethics my intellectual home. Years later, I was lucky enough to co-chair a National Academies committee on the inclusion of women in clinical research. Do you find that the public understands bioethics’ role in medicine? I think some people do but many do not. Most Americans have never talked to someone in bioethics. There’s not that many of us and our interactions with the public are not as frequent as they should be. Bioethicists are becoming more familiar in popular media outlets so public awareness is growing, but there’s a lot of room for more growth and more interaction. The public often understands bioethics as the “gatekeeper” between right and wrong. Is that a correct view? It is not the job of the field of bioethics to opine on the rightness or wrongness of anything. Bioethics is not a canonical court positioned to put limits on science or clinical practice. In fact, within the field, we often have many differences in opinion. As individual scholars, we can take positions on many ethically-contested questions and we should. However, the field of bioethics does not dispense collective judgement on society. There isn’t a monolithic bioethics position on anything. What new idea or innovation is having the most significant impact on the bioethics world? There are some issues in bioethics that will never go away. One of the most persistent questions in bioethics revolves around fairness in access to health care and medical technologies. That’s a topic that our field is going to examine forever. Who gets what when we can’t give everyone everything they need? How can we ethically determine who the “winners” and “losers” will be when thinking about big policy changes like universal health coverage or global response to a new pandemic event? A lot of issues in bioethics are evergreen in this way. Issues in bioethics are rarely driven solely by some new idea or technology developed in a laboratory. At the same time, a lot of work in bioethics happens in response to, or in anticipation of, new important scientific advances in biomedicine. We spend a lot of time in bioethics responding to specific new advances and also thinking generally about what certain advancements mean or how to think about new technologies in a societal context. When an opportunity presents itself, take it. When a challenge opens up, don’t doubt yourself. Go for it! Odds are, you’ll rise to the occasion. Have confidence in yourself and stop worrying about whether you’re good enough. This is especially true for young women early in their careers who wonder whether they really deserve a seat at the table. I’d like to tell them: You belong here. You are good enough. You are smart enough. Go for it! My family is and always will be the center of my life. I have an extraordinary husband and wonderful children and grandchildren who I love spending time with. In terms of hobbies, I have always loved to cook and I especially love to cook for my friends. Once in a while, I have friends over for a big dinner. Cooking allows me to clear my head and put my whole self into making delicious food. I’m happiest enjoying a home-cooked meal surrounded by the people I cherish most. What does it mean for you to receive the Adam Yarmolinsky medal? It’s enormously gratifying. I looked at the people who have received this award in the past and I feel deeply honored to be in their company. It’s so important that the National Academy of Medicine recognizes the importance of interdisciplinary approaches to addressing the nation’s most important issues in health and health care. This medal exemplifies that value. If the National Academies are to have the most fulsome impact possible, it’s critical to broaden the expertise on which we draw. When you can work through an issue with a group of people with diverse standpoints and different professional languages, you arrive at much better solutions. No progress will be made if everyone is talking only to people with the same training and the same experiences. The Yarmolinsky Award represents the exact antithesis of this insular approach. It is the NAM at its best. The Adam Yarmolinsky Medal is awarded to a member of the National Academy of Medicine from a discipline outside the health and medical sciences — for example, from fields such as the social and behavioral sciences, law, public policy, and administration. It recognizes distinguished service by a member who, over a significant period of time, has contributed in multiple ways to the mission of the NAM. To view past winners of this award, please click here.